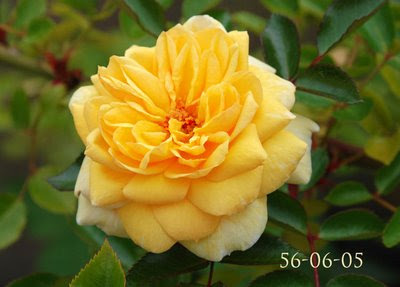 Paul Barden Roses: 56-06-05: a new yellow climber. 56-06-05: a new yellow climber. I've mentioned the Moore Wichurana breeder 0-47-19 several times before, and I thought I should show some of the work thats coming out of it. I use it with the goal of improving disease resistance, plus it often brings added vigor to a breeding line, and the seedlings are generally very easily rooted from cuttings. Illustrated here is 56-06-05, a cross of 'Joycie' X (0-47-19 X 'The Yeoman')*. The pollen parent, listed as 42-03-01, is a vigorous, once-blooming climber with glossy, disease free foliage and clusters of butter yellow blooms at most every leaf axil along the arching canes. 42-03-01 rarely sets seed and its pollen is only marginally fertile, but I have persisted in getting seedlings from it since it is an opportunity for improvement of the health and vigor of the breeding line. 56-06-05, the yellow seedling pictured here, is the first seedling from 42-03-01 worth mentioning so far, and I hope it passes on its health and vigor to another generation. 56-06-05 is also a vigorous climbing plant, with bright grass green glossy foliage that so far has had no problems with disease. Blooms are fully double and about 2.5 inches across, with a pleasant, but mild Tea (phenolic) scent that often accompanies yellows. It took two years for this seedling to mature enough to start flowering, which is a reminder that sometimes its worth keeping an interesting seedling, even though it may not bloom the first (or second!) year. I'm much more inclined to keep un-bloomed seedlings from unconventional breeding lines in the hopes that they may have traits of value in furthering the line. 56-06-05 appears to be fertile, as it has produced seed hips with several pollens. I won't be able to comment on fertility till next Spring when I find out if these seeds germinate or not. Note to breeders: I have a couple plants of 42-03-01, the pollen parent of the seedling above, if anyone is interested in working with this seedling. * 42-03-01 is listed as 0-47-19 X 'The Yeoman', although I have reason to doubt the parentage. I suspect this seedling may in fact be a 0-47-19 X 'Out of Yesteryear' seedling that got mislabeled, since it bears a strong resemblance to several seedlings from the latter cross. It is also suspicious that a cross using 'The Yeoman' would produce anything in yellow, whereas 'Out of Yesteryear' easily could. 56-06-05 is definately a lovely seedling. Does the yellow fade. I would be interested in 42-03-01. I was looking for some plants that have strong wichurana influence to possably to use as pollen parents. Is their any of the ramblers you would recommend or other hybrids of it. I was thinking maybe Jersey Beauty, Awakening, or Dr. W. Van Fleet. Is their something you would recommend? Many of these ramblers I can not find information if they are fertile or not. The disease resistance and the rooting ability are the two things that interest me the most about this species. To me a logical next step for this rose is a deliberate self pollination to see if remontancy might be brought back out in a similar plant... so I was wondering how often, if ever, you do a deliberate self pollination (as opposed to an OP) to try and bring things back out before moving on to an outcross? 56-06-05 does fade with age, yes. I know of no yellows that don't lose a significant amount of pigment as they age. I'll see how I can improve on it in subsequent generations. I know nada about 'Jersey Beauty', so cannot comment. Look it up to see if it has offspring. I tried using 'Awakening' as a pollen parent years ago and got nothing from it. I suspect there is no advantage to using this over 'New Dawn'; they likely behave alike in breeding. Many fine roses have come out of 'New Dawn', but since it is a "known quantity", I'd try some of the Barbier Wichuranas instead, like 'Alberic Barbier' and 'Paul Transon'. I didn't make this clear in my bio of 56-06-05, but now that it is maturing, it is becoming remontant. Yes, I would often test a plant first by collecting open pollinated seed to see if the plant is 1) fertile, 2) capable of restoring remontancy, and 3) if it has any conspicuous undesirable recessives that might be lurking. In this case, I went straight to one of my "indicator" pollen parents, 'Abraham Darby' to determine fertility. 'Abraham Darby' pollen will set seed on most anything, and if it doesn't then this tells me the prospective seed parent is probably infertile, or nearly so. It doesn't hurt that 'Abraham Darby' has often bred good seedlings for me as well. i just found your blog and am looking forward to spending more time here. i can't grow roses (too much shade), but i will live through your experiences. thank you for sharing.